Boletus huronensis A. H. Smith and Thiers is an uncommon mushroom of northeastern North America which causes severe gastrointestinal reactions to some who eat it. This article investigates the descriptive literature and develops a macroscopic-photographic examination of this mushroom for field mycologists and the Poison Control Community. On August 30, 2008, in coastal Maine, I made a collection of a mushroom new to me. 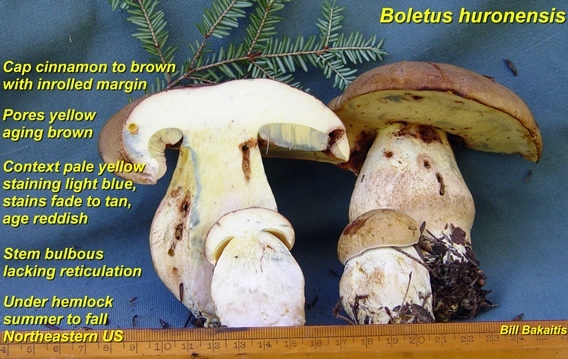 From the description and photos in Bessette, Roody, and Bessette's North American Boletes: A Color Guide to the Fleshy Pored Mushrooms. I was reasonably confident that it was Boletus huronensis. As is my custom with a new species, I took several photographs showing its characteristics from a few diagnostic angles. The day had been very productive and my wife, Leslie, and I had dozens of species carefully segregated in our baskets. With time being limited and mushrooms abundant, I simply lost track of this collection. One image shows it carefully field dressed for the kitchen and Leslie is quite sure it ended up in the pot. If so, the culinary aspects were no more pronounced one way or another from any of the other good Boletes we ate that week. Fast forward to July 2009 when I received a call from a Poison Control center, which ultimately involved a tragic death, apparently the result of eating a mushroom. Details of the case are quite sketchy and somewhat confusing. It appears that three different kinds of boletes had been harvested: Suillus pictus, "King Mushroom" and a Leccinum. Two kinds had been consumed and one kind thrown out, no mushrooms remained for identification. In the end a red capped Leccinum was implicated as the most probable cause of the initial digestive distress (which then apparently triggered a cascade of events leading to the death of an elderly, but heretofore robust man). Details of that case can be found at http://www.fungikingdom.net/ and include a quite lengthy discussion with several mycologists from the Northeast joining the discussion. Several suggested that B. huronensis should have been considered as a possible cause of the initial distress. In responding to their concerns and suggestions I was able to follow many leads. Several are included in that article with links to a few published accounts and reports of email exchanges and telephone conversations I had with those who had experienced toxic reactions. 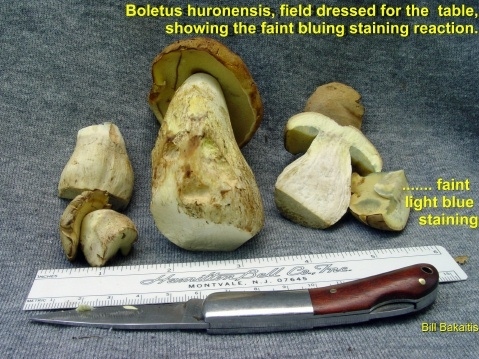 Andrus Voitk, in an article published in McIlvainea, wrote a particularly graphic description of the exceptionally severe gastrointestinal distress that can occur following consumption of what he later concluded must have been B. huronensis that he had consumed after mistaking it for Boletus edulis. Subsequent to this exchange I learned from knowledgeable amateur mycologists of a few more cases with descriptions of intense debilitating vertigo and digestive distress following the eating of B. huronensis. There now seems to be a general awareness that this mushroom should be treated with caution and probably avoided. Smith and Theirs first published this species in 1971 in their Boletes of Michigan (pp. 306-307) noting that "… [B. huronensis] is a very robust species with a much more bulbous stipe and darker pileus than in B. pallidus to which it is otherwise related." There is no mention of edibility or toxicity of this species which is included in their Section PSEUDOBOLETI (Singer), comb. nov., a small section which also includes B. pallidus and B. badius, both well known edibles. In 1976 Grund and Harrison in their Nova Scotian Boletes (pp. 112-114) observe that B. huronensis is "one of the common large boletes in the province and is another species misidentified for years as the European B. impolitus Fr…. The bulbous base, brown colors and membranous inrolled margin of the pileus are distinctive field characters. There is a slight bluish reaction when bruised that separates it from any of the varieties of B. edulis." They continue, "We have tested the edibility of this species, and report that it has an excellent flavor and no unpleasant after-effects. It is usually free of maggots while B. edulis found at the same time is often riddled with them, which adds to its desirability as an esculent." They conclude with the usual cautionary advice to try a small quantity at first. The 1981 edition of Smith, Smith, and Weber's How to Know the Non-gilled Mushrooms includes a short technical description of B. huronensis concluding, "Gregarious under hemlock, summer, northern Michigan." Again, there is no mention of edibility or toxicity. In 1993, Ernst Both published The Boletes of North America: A Compendium and includes this description of B. huronensis (pp. 159-160): "Pileus dull yellow-brown to dull cinnamon, context pale yellow, staining blue, then reddish when cut; pores yellow, bruising blue, finally reddish-brown; stipe pale bright yellow, bruising brown. 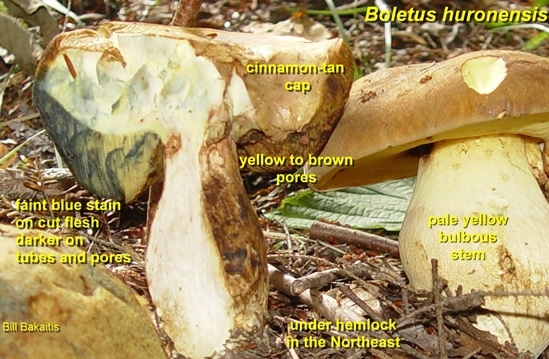 A large Bolete, resembling B. pallidus… Under Hemlock, in mixed woods, from New Hampshire west to Michigan." The 1997 Mushrooms of Northeastern North America (Bessette, Bessette, and Fischer) includes a good description of B. huronensis (p. 323) in their 'Key to Species of Boletellus, Boletus and Chalciporus.' (Couplet16). They conclude by listing it as 'edible'. There is no photo. "Pileus: 2-10" (5-25.5 cm) wide, convex, becoming broadly convex or irregularly expanded in age, margin with a narrow band of sterile tissue, incurved to inrolled at first, often wavy to irregular in age; surface dry, subtomentose to glabrous, dull yellow-brown, ochre-brown, or pale cinnamon-brown; context pale yellow, typically bluing when cut, but sometimes slowly or not at all; odor of mercaptan or not distinctive; taste not distinctive. Pore surface: yellow at first, becoming olive-yellow to brownish-yellow at maturity, often depressed near the stipe in age, staining greenish-blue, sometimes slowly or erratically when bruised, finally reddish-brown; pores 1-3 per mm, tubes 1-3.5 cm deep. Stipe: 3-8" (8-20 cm) long, 3/4-3" (2-7.5 cm) thick, enlarged downward, dry, solid, not reticulate or only so at the very apex, finely tomentose below, yellow at the apex, pale yellow to whitish below, sometimes with ochre or dull reddish tints; partial veil and annulus absent. Macrochemical tests: pileipellis produces a green flash, then stains orange with the application of NH4OH, pale orange with KOH, and bluish olive-gray with FeSO4; context stains orange with the application of KOH, pale grayish with NH4OH, and bluish olive-gray with FeSO4. Microscopic features: spores 12-15 x 4-5 µm, elliptical to oblong, smooth, pale yellowish brown. Fruiting: solitary, scattered, or in groups on the ground under hemlock; July-October; infrequent; eastern Canada south to New York and Connecticut, west to Michigan. Comments: This mushroom is sometimes misidentified as the European Boletus impolitus Fries, which does not stain blue on its pore surface or cut context and grows in broad-leaf forests. Its existence in North America is doubtful. Boletus pallidus Frost is smaller, lacks reticulation on the stipe, and has a whitish to buff or pale gray-brown pileus." An excellent 3x5" color photograph of a single mature specimen appears on p. 290. 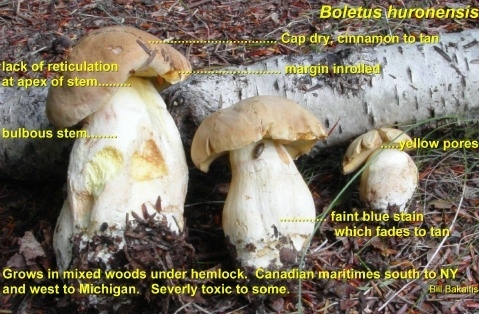 Two recent texts specifically refer to the toxicity of Boletus huronensis. Gary Lincoff's recent guide for foragers, The Complete Mushroom Hunter (2010), mentions that B. huronensis even after cooking "will give you a bad night nonetheless" and that drying or storage does not lessen the toxic effects. His description (p. 148) of huronensis concentrates on a comparison to B. edulis, most notably the white net-like reticulation on the top of the stem for B. edulis which is lacking in B. huronensis, the non bluing reaction of the cut flesh of B. edulis compared to the slow bluing reaction to the cut flesh of B. huronensis, and the white flesh of edulis compared to the yellow flesh which stains blue in B. huronensis. There are two 2x3" images of B. huronensis, but unfortunately the color saturation and quality does not permit the subtle tones to register. "In the Northeast, one porcini look-alike has been implicated in several sickenings. It is Boletus huronensis, and although some guides call it edible, there have been a few cases of people becoming sickened following a meal of this mushroom. 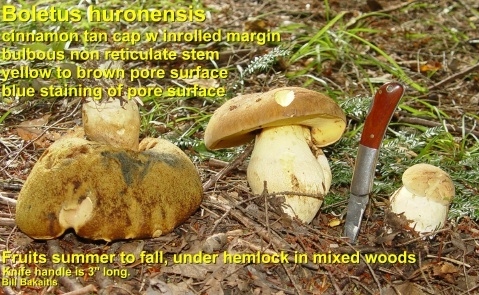 It can be differentiated from porcini by the pore surface that stains slowly blue upon bruising, the yellowish stem color, often with traces of red, and the lack of fine net-like veining on the stalk. Don't eat these mushrooms." Other recent field guides consulted (Barron, George, Mushrooms of Northeast North America: Midwest to New England; Hall, Ian, et. al., Edible and Poisonous Mushrooms of the World; Miller, Orson K., and Hope H. Miller, North American Mushrooms; Roody, William C., Mushrooms of West Virginia and the Central Appalachians; Spar, David L., Edible and Medicinal Mushrooms of New England and Eastern Canada) did not have a treatment of this mushroom. However, Boletus impolitus (pp. 228-229) in Phillips' Mushrooms of North America appears to be a misnamed B. huronensis. On the web, for those who read French, an on-line description and photos of B. huronensis can be found on Yves Lamoreux's Mushrooms of Quebec website. 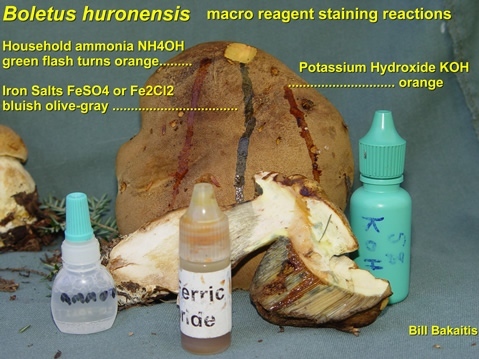 On the most referenced American English language site, Mushroom Expert, Michael Kuo only mentions B. huronensis in a key with a brief description. Unfortunately, Kuo includes neither a discussion nor photo of B. huronensis. Images available on the web. Two years ago when I was working on the poison control case described earlier I could find but a single image of B. huronensis from a Google Image search – and that was one I had posted a year earlier for a web post on Porcini. By last summer a few more images had been posted by Lamoreaux and his associates along with a few of lesser quality by other photographers. Because of the increased awareness of this as a troublesome mushroom and the general paucity of images or descriptions on the web, I recollected B. huronensis in the summer of 2011 with an eye toward making a set of reasonably clear diagnostic images. That set of images is included in this article. I hope these images will be useful to those of us who go about foraging in the northeast and think it might be particularly helpful to those who assist with poison control cases. Readers have my permission to pass these images along to any who might have a reason to see them provided attribution to me and McIlvainea is included. My voucher of the 2011 collection of Boletus huronensis has been sent to and accepted by Roy Halling at the New York Botanical Garden. I would also have included the voucher of the 2008 collection but Leslie believes it has been eaten! Neither she nor I have any intention of eating this mushroom in the future.